Work to dismantle the reactor pressure vessel's internals at unit 2 of the Oskarshamn nuclear power plant in Sweden is set to begin at the end of April. Plant operator OKG AB said this will mark the start of the first major decommissioning work at the plant. OKG awarded GE Hitachi Nuclear Energy (GEH) a contract in December 2016 to dismantle the reactor internals of units 1 and 2 at the Oskarshamn plant (O1 and O2). The work includes dismantling, cutting and packing the reactor internals for final disposal. All the segmentation work is to be carried out underwater. OKG said yesterday that preparation work is under way. At the beginning of March, GEH will start bringing in equipment that will be used for the segmentation work. A segmentation station is to be set up in the reactor pool of O2 into which components will be lifted, starting with the moderator-tank upper head and the steam separators. The components will be cut into two pieces using a circular saw and then placed in cassettes. The cassettes will then be placed in steel vessels using a radiation protection hood. "The vessels are manufactured in three different versions to satisfy the various requirements," said OKG project manager Billy Slättengren. "The vessel with the largest volume has walls that are 50mm thick, but there will also be vessels with walls that are 100 and 150mm thick, respectively. The most active components will be placed in vessels with a thickness of 150mm. When full, the heaviest vessel will weigh 43 tonnes." When the steel vessels are full, they will be transported to the underground storage facility for active waste at Oskarshamn and stored there until Svensk Kärnbränslehantering AB's (SKB's) long-term repository is ready, which will not be until 2045 at the earliest. Segmentation of the reactor internals of Oskarshamn 2 is scheduled to take about one year, with that of unit 1 set to begin in early 2019. The segmentation project is expected to be completed by the beginning of 2020. 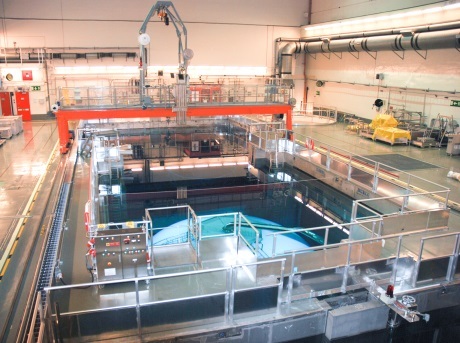 "Once we've completed the segmentation, we can drain the water from the reactor pool, which means that we can turn off certain systems and thus reduce the operating and maintenance costs," Slättengren said. "Once we've [removed] the radioactive components, the risk level at the plant will also be lowered, and technically speaking we'll have better conditions for the remaining decommissioning work." Although not part of the contract with GEH, the reactor pressure vessels of the units will also need to be segmented. This work - expected to start around 2020 - will mark the start of large-scale decommissioning and demolition of O1 and O2. German utility EOn - the major shareholder in OKG - decided in October 2015 that Oskarshamn 1 and 2 would be shut down permanently. Unit 3 was unaffected by the decision. At that time it said unit 1 would close between 2017 and 2019, there would be no future investments at unit 2 and the reactor will not be restarted. Last February, OKG announced the decision to shut down Oskarshamn 1 in conjunction with a planned outage at the end of June 2017.